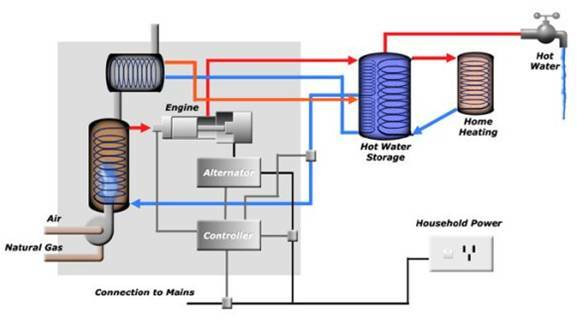 Combined heat and power (CHP), which can also be referred to as cogeneration, involves a system that generates both heat and electricity at the same time and thereby maximizes energy usage and efficiency. Traditionally heating and/or power units will burn a fuel, e.g., oil or coal, to generate either heat or electricity. In both cases these systems are inefficient because up to 70% of the energy can be lost to waste heat. The design of a combined heat and power system specifically allows for the energy that goes in to be more efficiently used and can result in up to 90% efficiency. Combined heat and power systems began as large scale power plants in the 1970’s, but after 2000 a combination of technological advances and rising energy costs allowed for the development of a market for micro heat and power (micro-CHP) units. Micro-CHP units are primarily used in homes and small office spaces and are controlled by heating demand, meaning that they often generate more electricity than is required by the domain. This excess electricity can either be stored or sent back to the grid. In either case it allows for a cost savings on energy consumption, and can even end up generating additional income. When using traditional heating fuels, e.g., natural gas, in micro-CHP systems the energy efficiency can be up to 50% greater, meaning that overall energy costs are reduced by 50%. Currently the majority of micro-CHP systems use natural gas with either an internal combustion engine or a microturbine, but because of the ongoing effectiveness of micro-CHP systems, technological developments in other areas, e.g., fuel cell technology, mean that future designs will be even cleaner, quieter and more efficient.